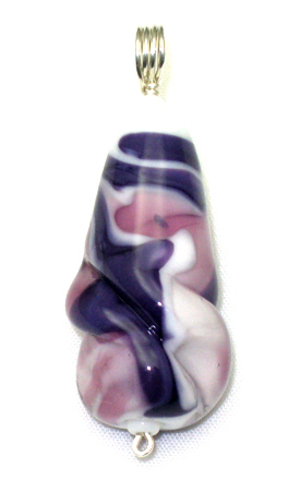 This round, teardrop shaped pendant bead is a combination of a unique purple glass with transparent amethyst glass on a white base. Cutting, dragging, and shaping the molten glass with a pick and paddle produced the beautiful patterning. Further detail and texture was added by scoring creases into the lower half of the molten glass.